We’d love to say that we’ve taken so long to post another story because we’ve been travelling in foreign climes or relaxing at some health retreat but of course this isn’t true. This summer and the complexities of fruit growing have kept us on our toes. It has turned out to be probably the most intense summer we’ve ever experienced. An unprecedented, scorchingly hot and dry 34 days averaging 39.5 degrees maximum (7 degrees above the norm). The truth is, in summer, the hotter it is, the busier you have to be. More attention has to be given to absolutely everything. Keeping our employees and ourselves as comfortable as we can is a good beginning and we start our work days as early as possible, to try and beat the heat. We even trialled some water cooling vests on the hottest days. Naturally, the trees are also under extreme stress and the threat of sunburn damage to fruit and fruitlets is an ongoing worry. Irrigation needs to be spot on. Despite this, sunburn has become evident on exposed fruit on the north western side of the tree especially in the more sensitive crops like mandarins and persimmons. Summer lemons have simply fallen off the trees. 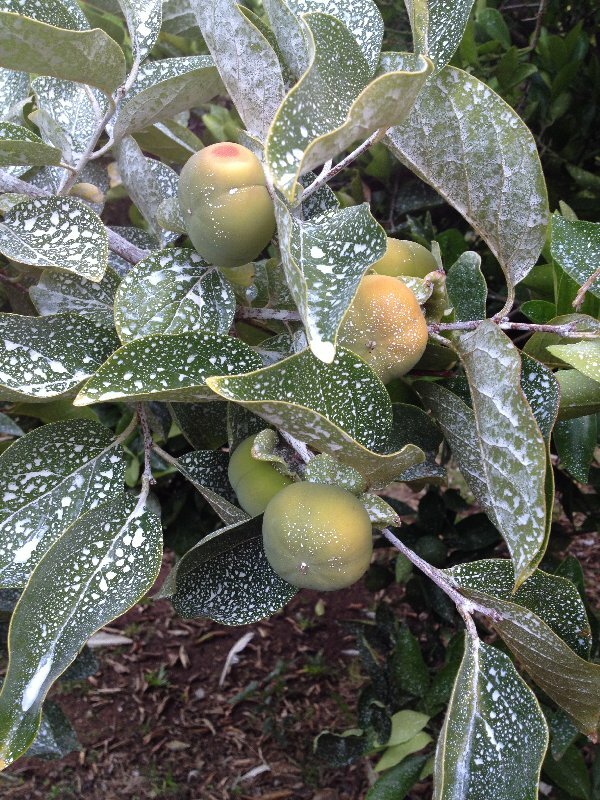 Persimmons showing sunburn – also sprayed with white clay for sun protection. We also shared the concern of our community and firefighters about the raging bushfire at Calperum Station and the Cooltong Conservation Park a few kilometres behind our ‘big’ block, which this year actually threatened irrigated properties. 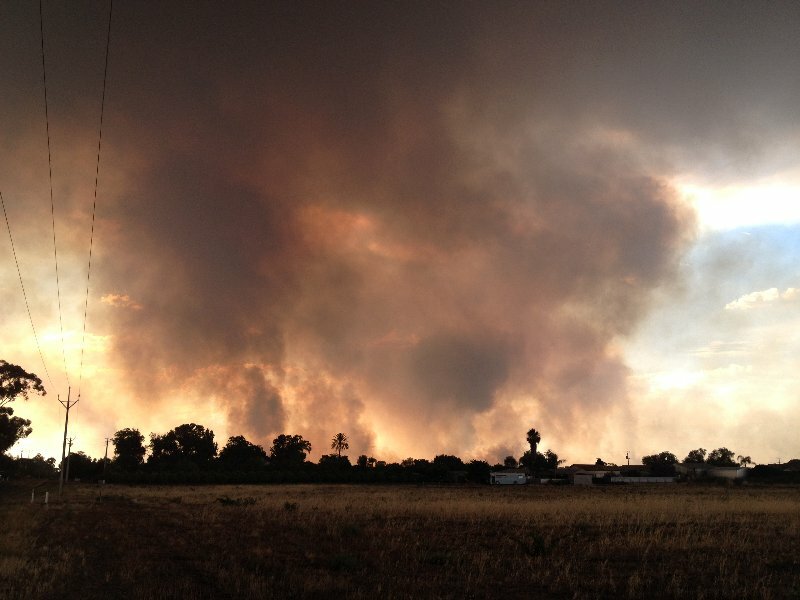 This really was a wakeup call for all of us who believed irrigated areas to be immune from bush fires. Smoke from bushfire some kilometres from home block. Equipment is also under more stress and has a tendency to break down. Poly water pipes come apart as they soften due to increased heat and animals need to be kept watered and cool. Everything can overheat! Electronic equipment, tractors, people! Fortunately, orders for our major summer crop, the Valencia, seem to increase as the mercury rises. Perhaps everyone wants to drink more juice and eat lighter style foods. Great we say and thank you. We took the opportunity to write this instalment on the 3 hour drive between Adelaide and Renmark. We don’t sit still for long and as we were trapped in the car..! That day we were returning to a drenched Renmark. In less than 24 hours our blocks had received over 90mm of rain. Puddles from this downpour can still be seen around the district over a week later. Oh the craziness of our weather!